The Roman Republic did not have political parties as we know them, but over time, the Senate became factionalized, as Patrician families sought to create or maintain a dominant position for themselves. As these factions increased their desire for power, the stability and efficiency of the Roman political system was compromised. During the Second Punic War, Hannibal was able to ravage the Italian Peninsula for fifteen years because the Romans were unable to defeat him in a major battle. Factionalism had the Romans arguing about their approach rather than working together to win the war. 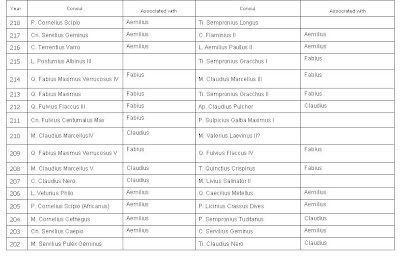 The chart below lists the Consuls during the Second Punic War and the families they were associated with. During this period the Fabii and Claudii were aligned against the Aemilii. Remember two consuls were elected each year. You can click on the chart to enlarge it. The Fabii/Claudii were considered conservative (Senate orientated) while the Aemilii were progressive (for people's rights). Q. Fabius Maximus was able to keep the conservative faction in control of the war strategy until the emergence of Publius Cornelius Scipio. Scipio's personality and military skill dominated Roman politics in the second half of the war, and caused the faction power struggle to shift to the Aemilii.